Doornbos Equipment UK are now stockists of TST Sweden’s range of PPE waterjet protection clothing. TST Sweden provide protection for up to 3000 bar. Protective equipment from TST use technically advanced features, high level of comfort and high quality. 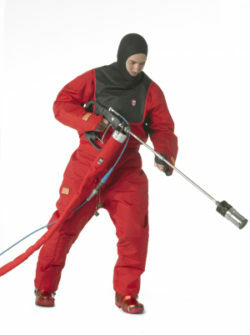 Waterjet protection clothing can be used for water blasting and hydro-demolition for HP and UHP work. For more information on the full range of TST suits available and also pricing, please contact the team.